There’s a great scene in Office Space where the movie’s heroes check their ATM balance after one of them has written a program to scrape tenths of pennies off of Paymetech (the movie’s fictional company) transactions. The guys figure this action will both go unnoticed and also generate a relatively modest sum for them. Instead when they check their balance it turns out that the sum of their tiny rounding transactions actually equated to over $400k to them over a weekend! It’s a funny scene (and a funny movie) but the moral here is actually important: The sum of a large number of small actions can be huge. 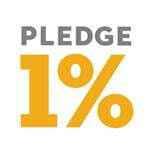 Today we’re announcing the launch of Pledge 1%. A joint effort between The Entrepreneurs Foundation of Colorado, The Salesforce Foundation and The Atlassian Foundation, Pledge 1% encourages entrepreneurs and companies to give back to their local communities through a gift of equity, profits and/or product. With Pledge 1% we’re aiming to aggregate a large number of smaller transactions to create meaningful impact. For years we’ve seen the benefit of companies giving back to their communities through the Entrepreneurs’ Foundation network. Since it’s founding 7 years ago, EF Colorado alone has generated over $3M in direct philanthropy back to local non-profits. And we’ve seen participating companies benefit from the incorporation of clear values from their very founding. But we can and should do so much more. Pledge 1% aims to encourage all companies to incorporate a small pledge of philanthropy into their corporate culture through the pledge or gift to a non-profit of their choosing. This gift can be in the form of stock from the company, a pledge of stock from founders or other employees, gifts of time, gifts of profit or gifts of product. We’re encouraging the entrepreneurial community to put a stake in the ground around the importance of giving back. Pledge 1% acts as a clearing house for these gifts and pledges with simple tools to encourage and facilitate giving. In addition to myself, the Pledge 1% founders include Mark Benioff of Salesforce, Ryan Maretns of Rally, Scott Farquhar of Atlassian, Jeremy Stoppleman of Yelp and Dan Siroker of Optimizely. Check out what we’re doing at www.pledge1percent.org. And join me in making the pledge.